There’s no place like home. 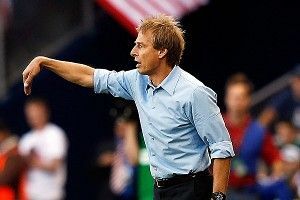 After slumming it on a muddy cricket field in Antigua, the United States returned to the warm, juiced embrace of LIVESTRONG Sporting Park, where Jurgen, Clint, and Michael Bradley collectively throttled Guatemala 3-1 to enter “The Hex,” the final stage of World Cup qualifying. To mark the occasion, the Men in Blazers welcomed U.S. legend and ESPN studio analyst Alexi Lalas to the pod. The well-known defender, who played both Stateside and in the celebrated Serie A, offered his thoughts on head coach Jurgen Klinsmann and reminisced about his own experiences with the U.S. team in the dark ages of the 1990s, before closing with a heartfelt message for gingie kids everywhere: Stay the course, and maybe you, too, can support Hootie and the Blowfish on a European tour. As expected, Michael and Roger also paused to comment on England’s World Cup qualifying blight, analyzing the least-impressive 5-0 blowout in the history of the game. Their opponent? The mighty enclaved micro-state San Marino (pop. 32,140). It got us thinking. If San Marino can field a side to play internationally, why not GFOP Nation? We intend to challenge the Sammarinese on their own turf. To participate in this historic campaign, please send your footballing résumés our way.